Depending on what need and purchased version, we can plan what servers needs to be deployed. For instance, if we go with Horizon Standard, we will need an additional Composer server, as Instant Clones aren’t included in the Standard version. Here is a comparison of features in the different versions: In my LAB I will go with the enterprise version due to my future plans for the LAB and my NFR License. Sizing the Virtual Machines for the Connection Server is fairly easy as this is described nicely in the VMware documentation. I will address this more closely in my section about the Connection Server setup. What version are we going to use for our VDI’s? First determine Enterprise or Professional? See a comparison from Microsoft here: https://www.microsoft.com/en-us/windowsforbusiness/compare The most obvious differences as I can determine, are the integration with some Windows Defender and Analytics features. So, as far as I can determine, if we are not going for LTSC, we might just as well go with Windows 10 Professional. LTSC is only available in Enterprise. Next we have to determine, CBB or LTSC. Although its tempting in a VDI-environment to choose LTSC, be aware that the Office 365 ProPlus installations of Office is not supported by Microsoft from 14. january 2020. So, this might deter from using LTSC, as more and more companies goes over to the Office 365 model. On the other hand, if you plan to go with Microsoft Office 2019, the LTSC-version might actually be both faster and better. There are a lot of discussions out there on the web, what version to choose, but I liked Ivo Beerens blog about this topic posted here: https://www.ivobeerens.nl/2018/10/24/what-windows-10-version-for-my-vdi-desktop/ There is also another aspect to be considered when choosing version for the VDI-template, if you plan to use VMware User Environment Manager and/or AppVolumes, we have to do a compability-check towards these products as well. As I’m going to be using MS Active Directory with a smart OU-structure, this also has to be taken into my plans. How will I organize the VDI’s computer-accounts in AD and how will the users settings be applied through GPO’s? I will need to create both user and groups for different usage in my Horizon setup. I have therefore created an xls-file which I will be using in my deployments. These users, service-accounts, SQL-users and groups will also be used during my setup of App Volumes, User Environment Manager, JMP etc. Depending on existing antivirus/antimalware solutions running in an environment, we have to take this aspect into consideration when planning for VMware Horizon View. I know providers like Trend Micro, AVG and similar, have best-practice guides for how to configure their product in a VDI-environment. Some providers even have their own VDI-agents, created specifically for exactly these kind of scenarios. 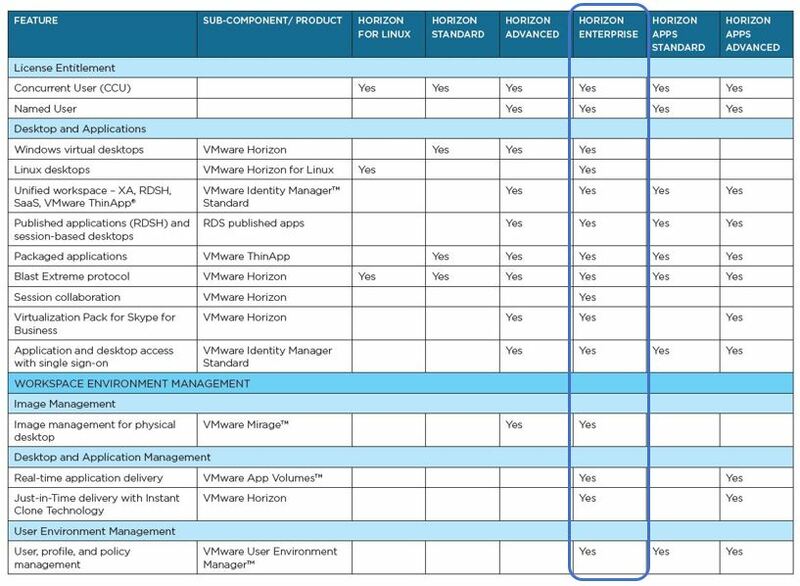 I therefore always check out these sources when planning for a VMware Horizon View setup, as a wrongly configured antivirus/antimalware agent can be the reason for poor performance and other unforseen problems. Ivo Beerens: What Windows 10 version for my VDI desktop?